In many respects these products are not really in the same market, and as such a direct comparison is a fairly futile exercise. Tableau has popularized the visualization of data, and has been adopted by numerous suppliers of analytics technology who lack their own data visualization capability. The main strength of Tableau is its ease-of-use, although a number of suppliers have risen to meet this challenge over the last eighteen months. Logi Analytics is one such supplier with its relatively new Logi Vision platform. 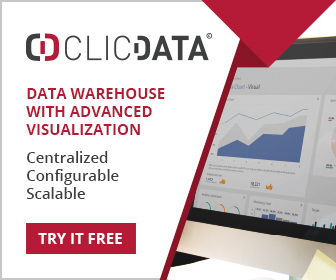 This provides a highly visual drag-and-drop environment that compares well with products such as Tableau. However Logi Analytics also offers Logi Info, more focused on production BI requirements such as operational reporting, embedded BI and the creation of BI apps. 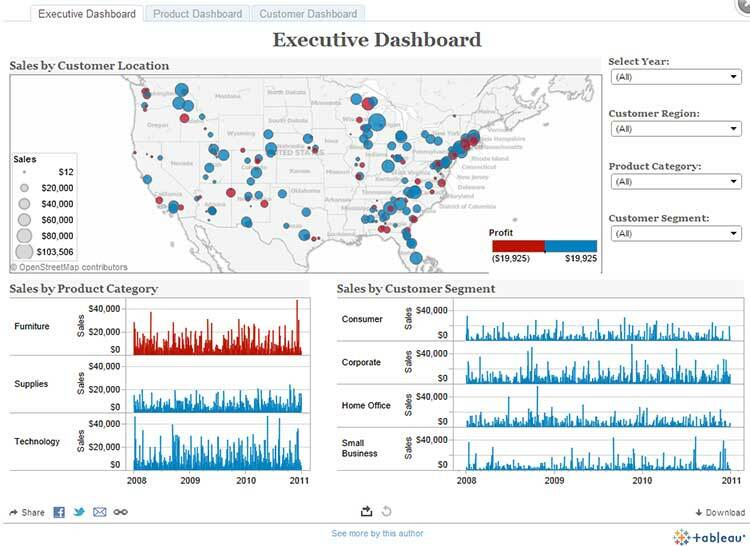 Tableau is often best positioned as a powerful adjunct to a broader enterprise BI capability, and particularly when a BI platform does not offer strong data visualization capabilities. Logi Analytics is a true enterprise BI solution, with its own impressive data visualization capabilities. The relatively poor extensibility of Tableau means that building bespoke visualizations might be difficult, whereas Logi Analytics is built from the ground up for extensibility, and almost anything is possible. The architectures of the two products are similarly wholly different. While the Tableau architecture scales well, it is focused almost entirely on the creation, distribution and consumption of data visualizations. Other forms of analysis (statistics, predictive analytics, text analytics etc.) can only be accommodated through a fairly crude interface to the open source R language. Logi Analytics has recently reengineered its product set with other forms of analytics in mind. These have not been fully implemented yet, but will eventually provide an integrated environment for diverse analytical methods. So the choice is fairly straight forward. If an organization simply needs to enhance its current analytics platform with data visualization, then Tableau is a good way to go. Although it has to be said that Logi Vision will also satisfy this need. However if a broad BI capability is needed, then Logi Analytics offers itself as a capable, broad solution to enterprise needs. 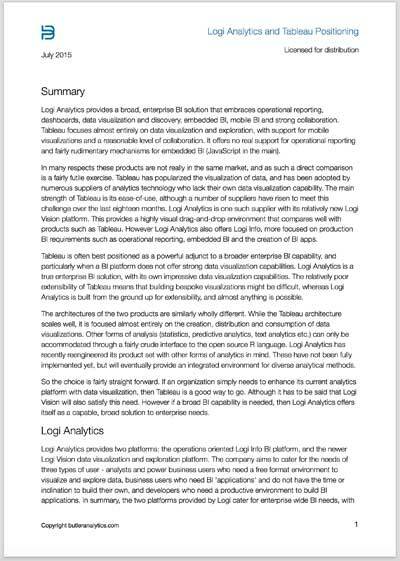 Logi Analytics provides two platforms: the operations oriented Logi Info BI platform, and the newer Logi Vision data visualization and exploration platform. The company aims to cater for the needs of three types of user – analysts and power business users who need a free format environment to visualize and explore data, business users who need BI ‘applications’ and do not have the time or inclination to build their own, and developers who need a productive environment to build BI applications. In summary, the two platforms provided by Logi cater for enterprise wide BI needs, with reporting, dashboards, charts, data visualizations, portals and other information formats all within easy reach of this very capable platform. Logi Analytics has been around for over a decade and is particularly well established as a production reporting environment. It also supports very sophisticated embedding, so that BI applications can be made to look part of other operational systems. However the company has recently invested heavily in data visualization and exploration products – specifically Logi Vision. And new in version 12 is the DataHub, a centralized component for data connection, manipulation, enrichment and integration. It also provides a columnar database for multidimensional analysis in Logi Vision. It comes with connectors for a wide variety of data sources including databases (MySQL, SQL Server, Oracle etc. ), applications (NETSUITE, SAP, QuickBooks etc. ), cloud applications (salesforce, eloqua, Marketo etc.) and files (Excel, CSV). The capability offered by Logi is very broad, and there are no reasons why a business might not use it as an enterprise BI solution. And while Logi is a bit late to the data visualization party, the company has clearly emulated the best of what is out there and improved on it. Logi Vision compares well with many other leading data visualization platforms, including Tableau and Qlik Sense. But it equally competes with IBM Cognos and Microstrategy, and offers a less monolithic environment in which to satisfy production BI needs, as well as data visualization and exploration needs. Logi Analytics has not achieved the popular status of some other suppliers, but after considerable investment it now has products to compete with the best in the BI world – the rest depends on marketing – as always. Without doubt Tableau Software set the pace for easy-to-use data visualization and exploration software. In practical terms this means business users can get to their data, typically without assistance from IT, and create graphs, charts and dashboards in a way that is most meaningful to them. Authoring takes place on Tableau Desktop which, as a stand-alone environment, can perform its own analysis, either against the Tableau in-memory database, or against external data sources – databases, cloud data sources, spreadsheets and so on. In a group or enterprise setting Tableau Server acts as a central facility for data access, delivering visualizations, enforcing security and managing user access. Tableau Server distributes visualizations through the web browser to almost any device that supports a web browser – desktops and mobile devices. I set out by saying that Tableau set the pace, but in reality it is now at least equalled by several other products. Qlik Sense, Logi Vision and Spotfire have all been reengineered for an easy to use experience, and there are cloud based products such as Sisense and GoodData. And of course we should not forget Microsoft’s latest foray into the world of data visualization and exploration with Power BI Designer. It’s immature, but it will be disruptive. Tableau is not an enterprise business intelligence solution, and the fact that several other suppliers use it as a data visualization front end betrays its real use. It is a powerful augmentation of a broader business intelligence solution. As an organization Tableau is very much in tune with business user sentiment. Their marketing and sales activities are sometimes seen as a bit aggressive, but the rapid growth of Tableau demonstrates its effectiveness. They have taken business intelligence to the masses, and in the process have almost turned business intelligence into a consumer product, with associated marketing style and branding. There are dangers associated with this, but Tableau is addressing the frustrations of business users, who simply want to see their data in a meaningful format.